Color: mainly silver. Material: durable hard alloy and rhinestone. Crown size (W*H): about 16.5*4.5cm. Headband style tiara with small comb on the edge, which can grip the hair more tightly. Some shining crystal rhinestones decorated on the crown headband, very delicate and attractive. Suitable for bridal or brdesmaid to wear in the wedding party, and also suitable for prome and other occasion you want to be more charming. 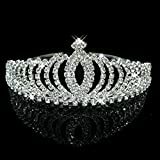 The item is a fashion and beautiful crown headband tiara, which is made of durable hard alloy, and inlaid with some sparkling shining crystal rhinestones to make it more outstanding and attractive. It is perfect for bridal to wear in wedding party or other occasions you want to be more charming.